Joan Miro's unique combination of surrealism and cubism created a style that not only went on to redefine the art of contemporary southern Europe, but created an original style that is not just fun but consistently elegant, as well. 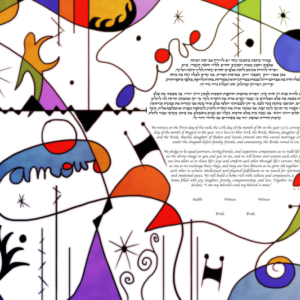 The Amour et Couleur Ketubah is the right ketubah for the couple who loves the modernist style and everything it represents: updating the tradition for modern times while keeping a classy look, that you're proud to show off. Miro's surrealistic style is thoroughly modern–with an old-world, European flair to it. Joan Miro had a knack for taking classic themes and updating them perfectly. 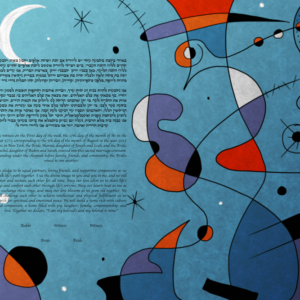 The Luna Púrpura Ketubah is our second take on Miro, and probably our favorite, personally. Its nocturnal theme starts your marriage off on a quiet and subtle, yet new and modern, note: the moon harkens back to nature (the style of traditional Ketubot) and God, who created it all and is watching over us.